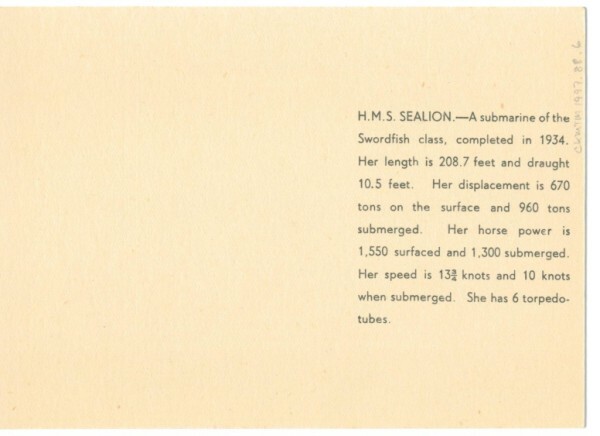 Description Most likely issued in 1942. 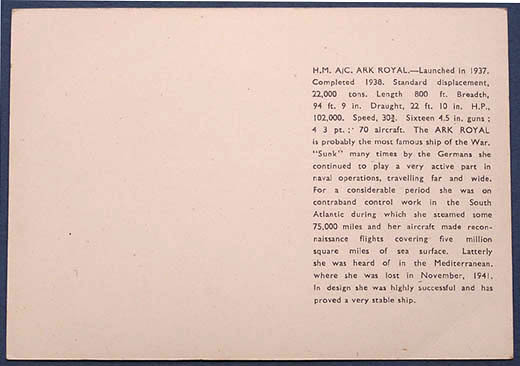 There are two editions, both at 1/-d. There is also a version of the second edition known with a 1/4d sticker. Both the first edition and the second edition are very rare. 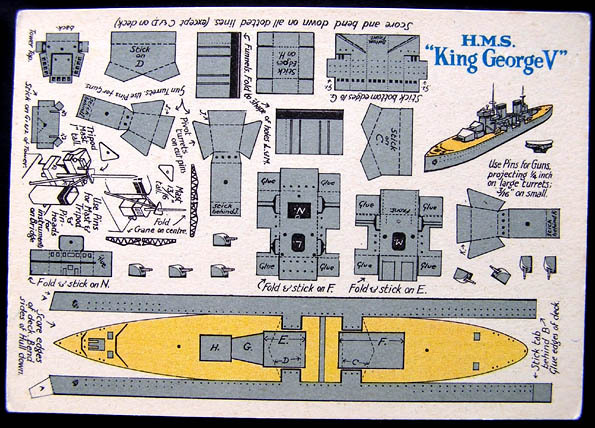 As with sets A1 , C1, F1 and H1 each card is protected by a coat of varnish that has mellowed to a very pale brown over the years. 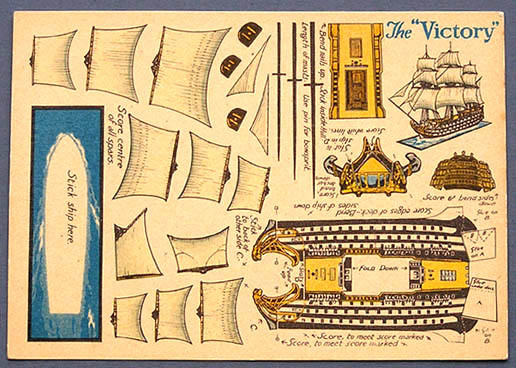 Each card carries text on the reverse. 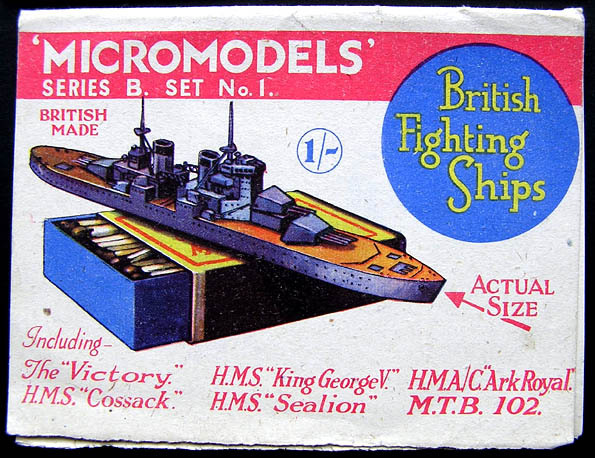 The 1st edition wrapper shows the King George V as a waterline model on top of a matchbox. 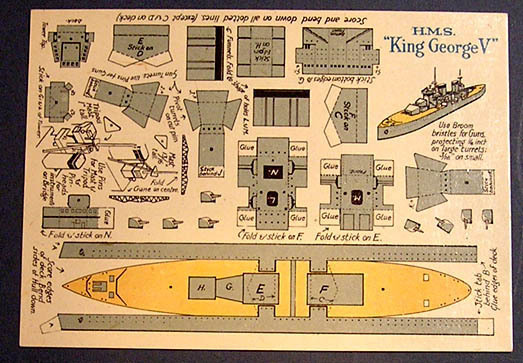 The drawing of the King George V is crude and inaccurate. 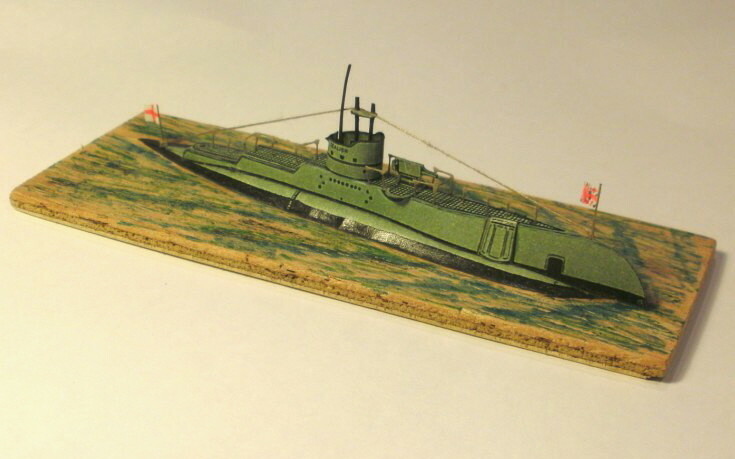 This model lacks a display base. 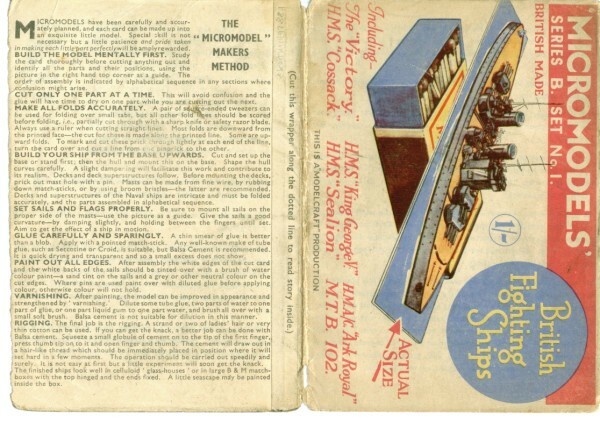 On the 2nd edition the wrapper is completely re-drawn with the model much more accurately depicted. 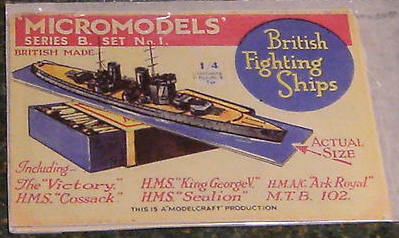 Now the King George V is shown mounted on a base. 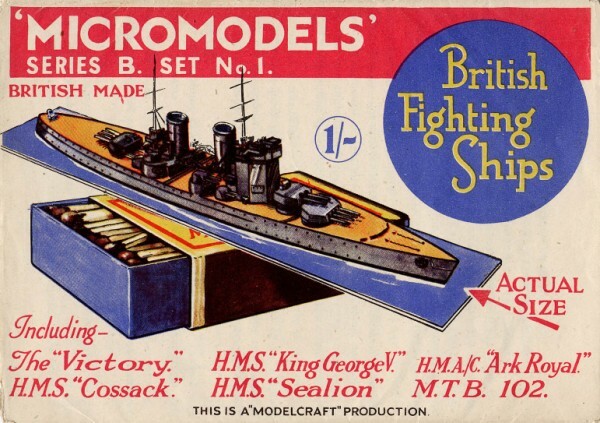 “British Made” is on one line instead of two. 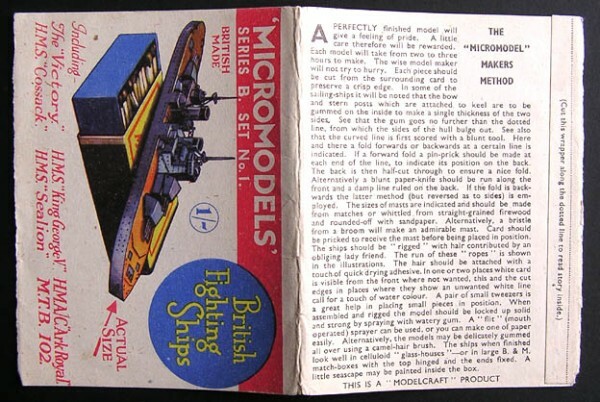 At the bottom of the 2nd edition wrapper is the wording, “This is a Modelcraft Production”. 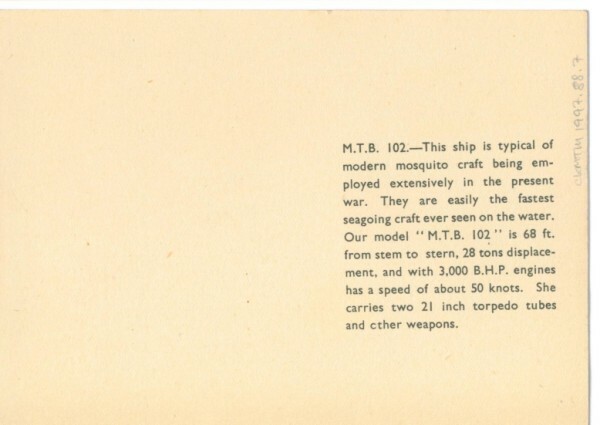 The 1st edition has no such wording. 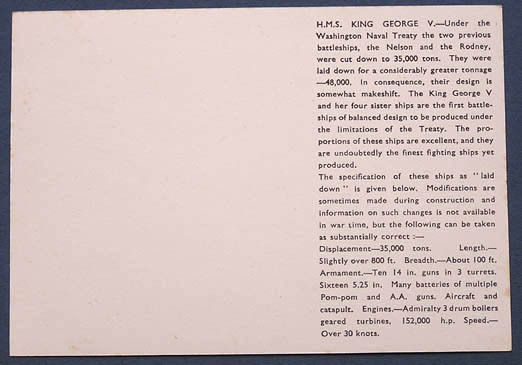 On the back of the second edition wrapper the text is completely rewritten. 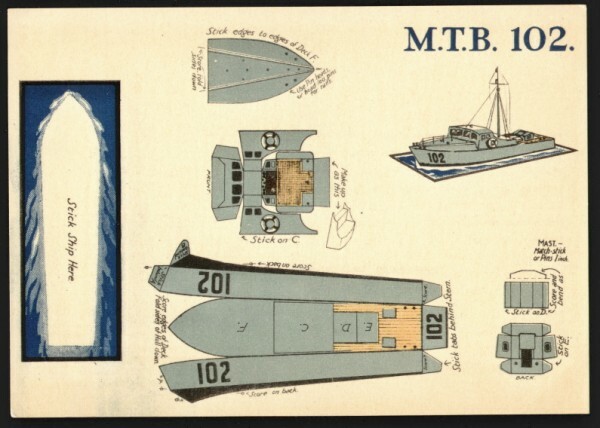 There are also differences between the 1st and 2nd edition cards. 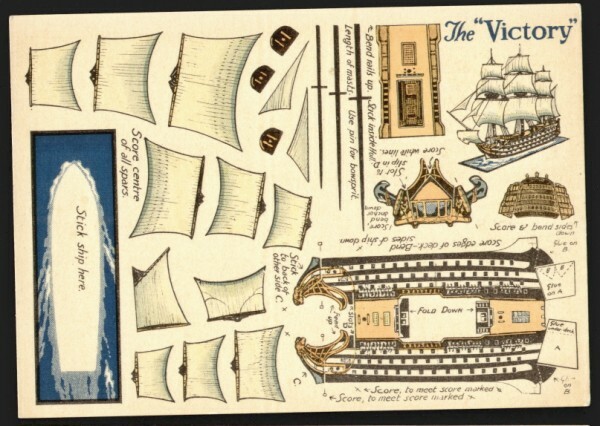 The 1st edition Victory has no bowsprit sail. 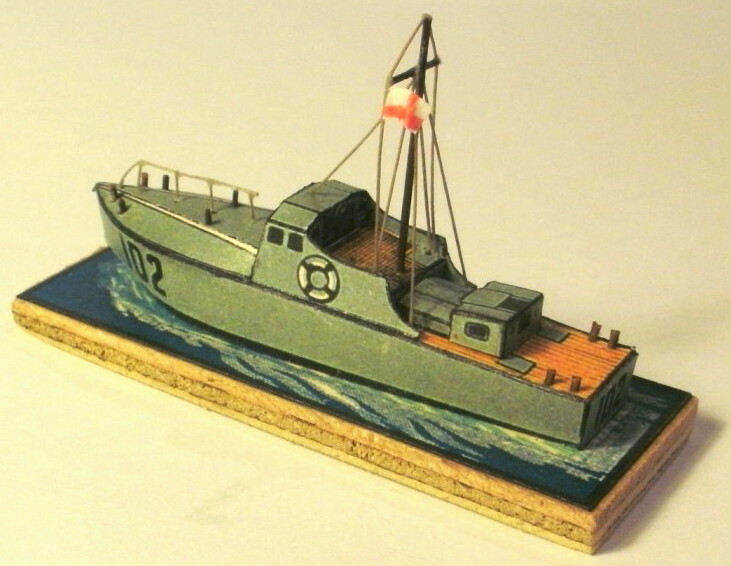 The 2nd edition has a bowsprit sail added. 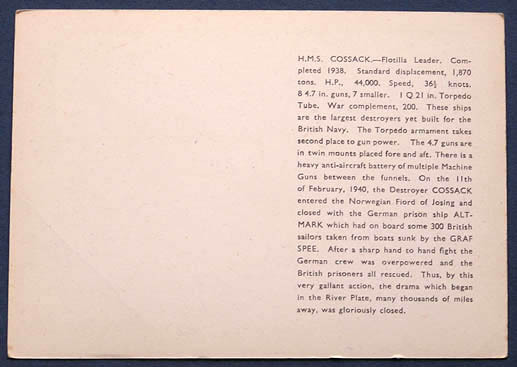 HMS Cossack remains the same from edition 1 to 2. 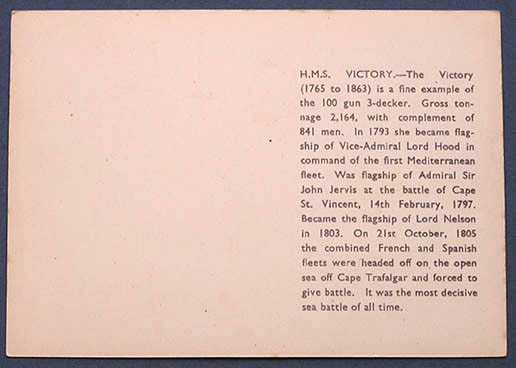 The 1st edition King George V card informs us that we should use broom bristles for guns. Some of the fixing tabs are in white. The 2nd edition card changes the gun requirements to pins, and has mostly grey tabs. 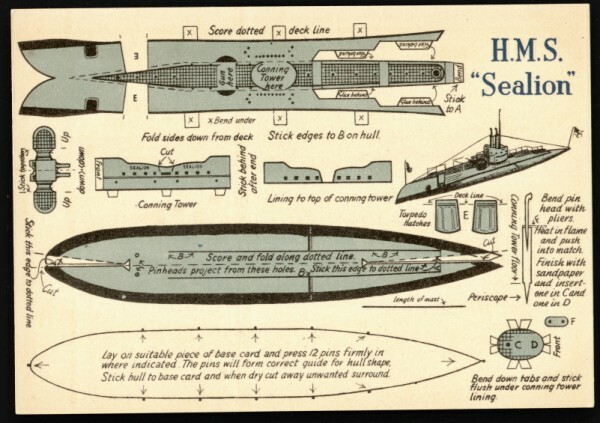 The card for the Submarine HMS Sealion is totally re-drawn from edition 1 to edition 2. 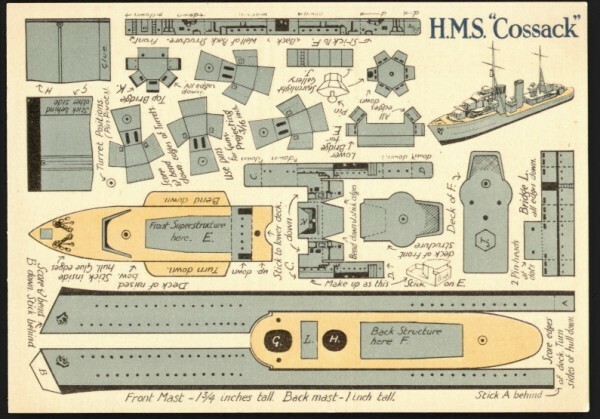 The 1st edition obviously did not make up correctly so the 2nd edition shows a method of jigging the hull with pins that will provide the correct hull shape. 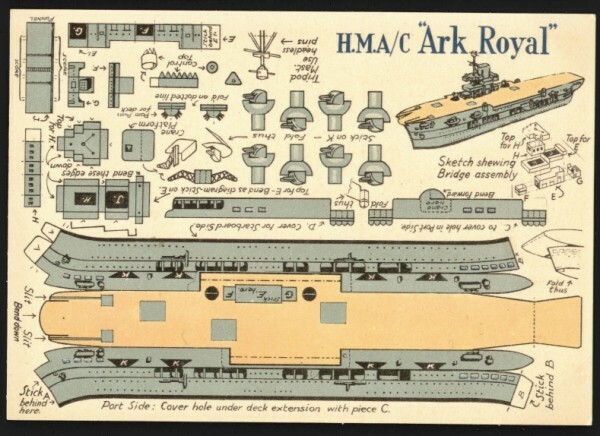 The 1st edition Ark Royal card has no diagram for assembling the bridge. 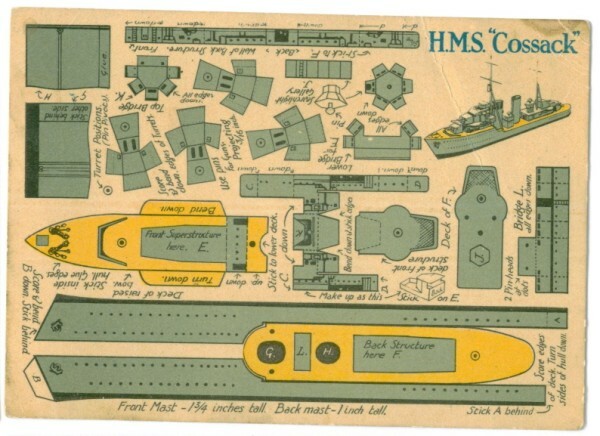 The 2nd edition gains a bridge assembly diagram under the drawing of the completed model. 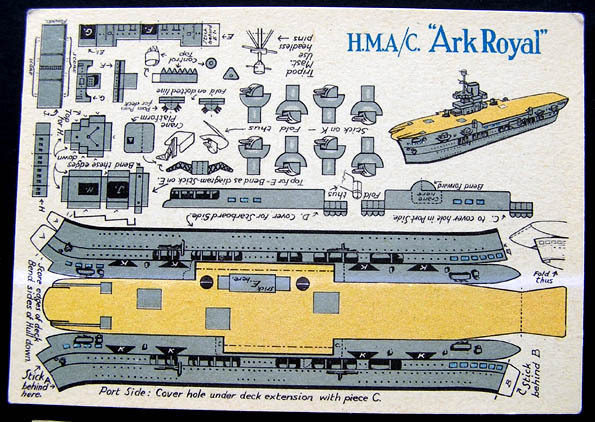 On the back of both these Ark Royal cards is a reference to the ship having been sunk in November 1941. 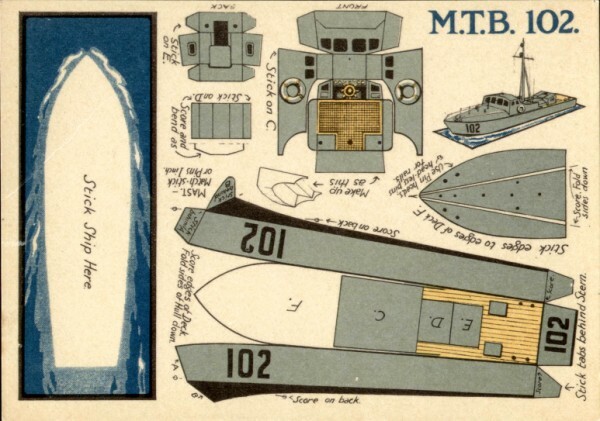 The artwork of the 1st edition MTB 102 is quite large. The base fills up the whole of the left hand edge. 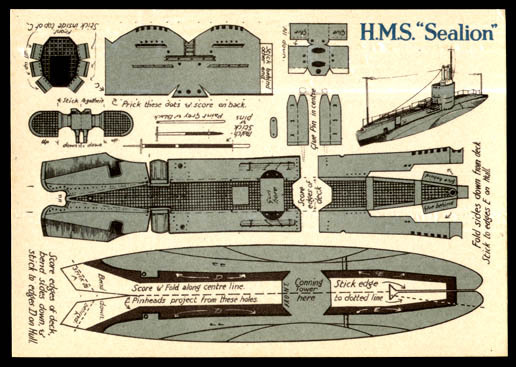 The 2nd edition is basically the same artwork but reduced by about a third and re-positioned on the card.